NATO Expansion is looking to become President Bush’s last-ditch attempt at some meaningful, positive foreign policy legacy. Even Donald Rumsfeld crawled out from under his rock to voice his support for this goal. 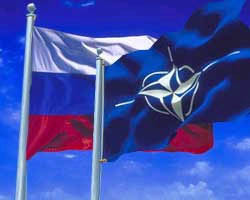 Specifically, Bush hopes to expand NATO’s membership to include Ukraine an d Georgia. The problems? Medvedev doesn’t like it (“no state can be pleased about having representatives of a military bloc to which it does not belong coming close to its borders”); a majority of Ukrainians don’t want to join NATO (though the EU would be nice); Georgia’s ‘frozen conflicts’ in Abkhazia and South Ossetia essentially preclude it from membership, not to mention the ‘issues’ with its recent elections; and, apparently, NATO doesn’t even like it. Party Politics – Nezavisimaya Gazeta is reporting that President Putin will likely become the official leader of United Russia at its upcoming party congress. Corruption – Kommersant reports that 55% of Russians do not believe corruption can be defeated. On a more positive note, the percentage of respondents who thought that corruption had increased in the past year fell from 74% to 46%, which I think is pretty significant. Could this be related to the rise in public employees’ salaries last year? Meanwhile, President-elect Dmitry Medvedev proposed a novel anti-corruption measure – prohibiting ‘control agencies’ (e.g., fire, sanitary inspectors) from visiting small businesses without a court order. UES Privatization – the state electricity monopoly continues its sell-off, with the announcement that Electricite de France and TransNeftServis will acquire UES’ OGK-1 utility, valued at $7 billion. UES is even selling its main office building in Moscow. The dismantling of UES should be complete by July. What’s next for Chubais? I’d like to make two comments. NATO expansion. In today’s Washington Post, Jim Hoagland (I believe he’s a bad columnist, but he’s got “sources”) claims that the idea of extending MAPs to Ukraine and Georgia is dead. The “killer” is Angela Merkel who’s opposing NATO expansion, at least at this point. It’s the best of two worlds: Russia is happy and Bush won’t be accusing in betraying the expansion cause. Putin as UR leader. Let’s wait and see. A couple of weeks ago, the very same NG circulated rumors that UR will be split in two. Obviously, the two scenario — Putin at the helm of UR and UR split in two — are mutually exclusive: if Putin leads UR, who’d like to go in opposition to him? -NATO: I heard it was dead too, but then after Saak came last week, Bush made it sound like he would make a final push for it. Maybe Cheney got Rumsfeld to write that editorial? -UR: I wonder if the constant swirling of rumors and speculation about UR proves that it has power, or proves that it has no power?